Topcon Positioning Group released a new workflow bundle designed to modernize concrete FFL (floor flatness and levelness) applications. 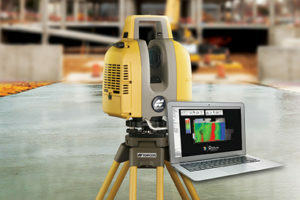 A new ClearEdge3D development and sales partnership with a leader and pioneer in 3D laser scanning software for construction QA/QC, Rithm, is prominently advancing the Topcon concrete application offering with a new hardware and software bundle option. It is part of the Topcon comprehensive approach to modernize core concrete applications such as layout, quality control and concrete screed with the latest capabilities in precise positioning technology. “With our real-time position information constantly updating, you efficiently manage material as it’s placed — delivering the highest quality in a fraction of the time,” Srivastava said.